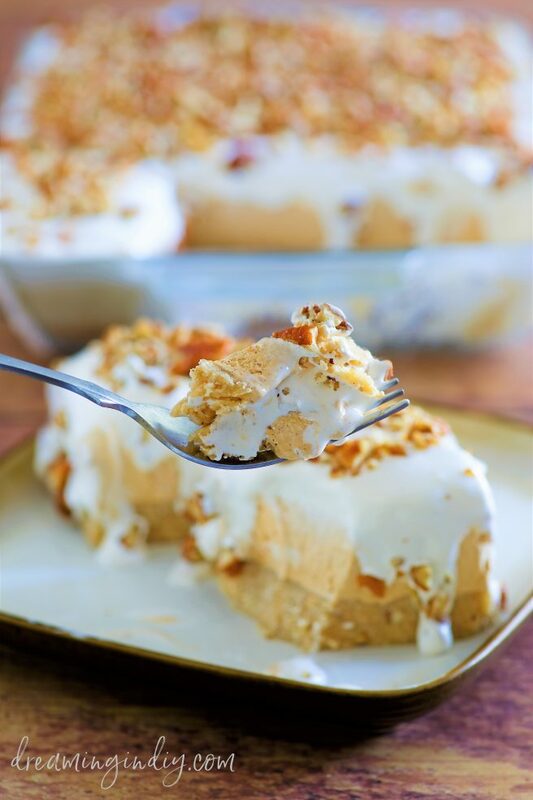 This no-bake, creamy, easy and YUMMY layered pumpkin dessert recipe is going to be the star of your fall and winter holiday parties! This is a Thanksgiving Dinner and Christmas party dessert table must. Pumpkin spice fans will be in autumn and winter treat heaven with every single bite. 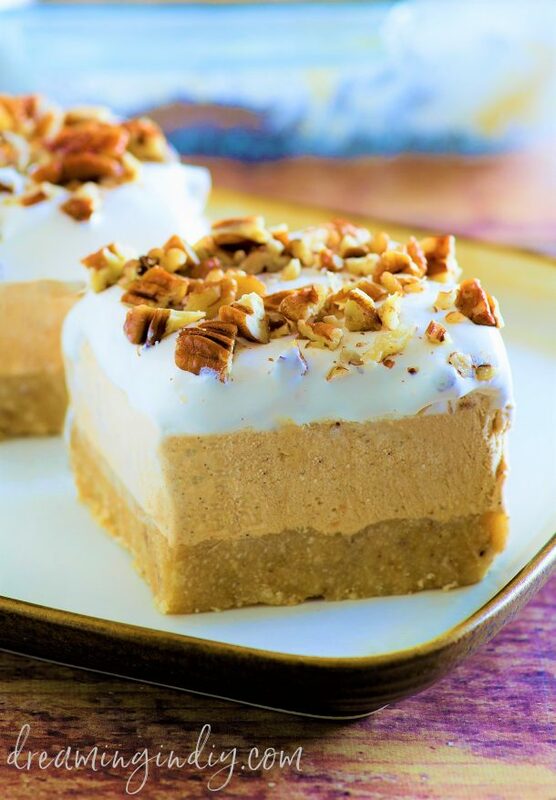 Easy layers of pecan shortbread, creamy pumpkin spice, whip cream topping and crushed pecans come together to create your new family favorite holiday dessert. You are going to love how easy and quick this is to throw together and chill. If you aren’t a fan of “Cool Whip”, feel free to use real whip cream – it’s scrumptious either way. Make sure to bookmark this recipe so it’s handy to forward to the other party guests. EVERY pumpkin spice fan there it is going to be asking you for it. Before you forget – make sure to PIN THE IMAGE BELOW to find your way back! You’re going to get repeat request for this one. Grease a square 9×13″ glass baking dish with cooking spray and set aside. In a large zip lock baggie, mix together the coarse pecan shortbread cookie crumbs and melted butter until moistened evenly. Press the mixture into the prepared pan. Set aside. In a large bowl, whisk together the pudding mix, milk and pumpkin pie spice until thick, about 1 minute. Fold in ONE of the full 16 oz. containers of the Cool Whip until combined. Spread the mixture into the prepared pan on top of the crust layer. 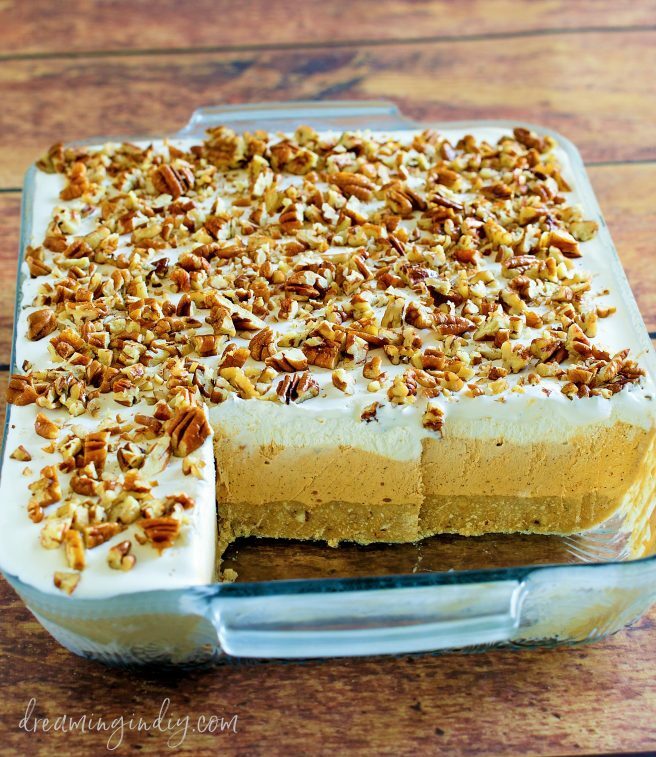 Top the pumpkin layer by spreading the remaining Cool Whip evenly on top and sprinkle it with the chopped pecans. Refrigerate for at least 6 hours or until set. Every bite is a little taste of fall and winter heaven! Here’s a handy printer friendly version for your binder full of favorite recipes! 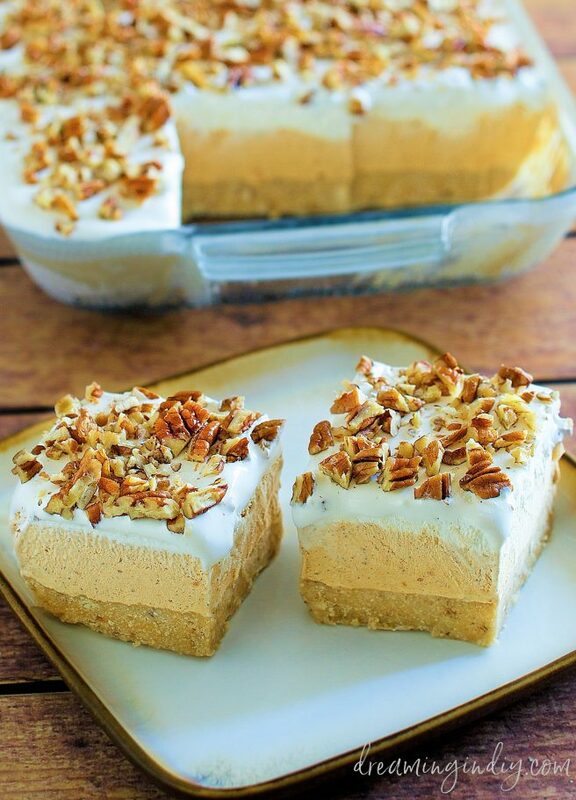 Easy layers of pecan shortbread, creamy pumpkin spice, whip cream topping and crushed pecans come together to create your new family favorite holiday no-bake dessert! Grease a square 9x13" glass baking dish with cooking spray and set aside. In a large zip lock baggie, mix together the coarse pecan shortbread cookie crumbs and melted butter until moistened evenly. Press the mixture into the prepared pan. Set aside. Don’t forget to PIN THE IMAGE BELOW to keep coming back! 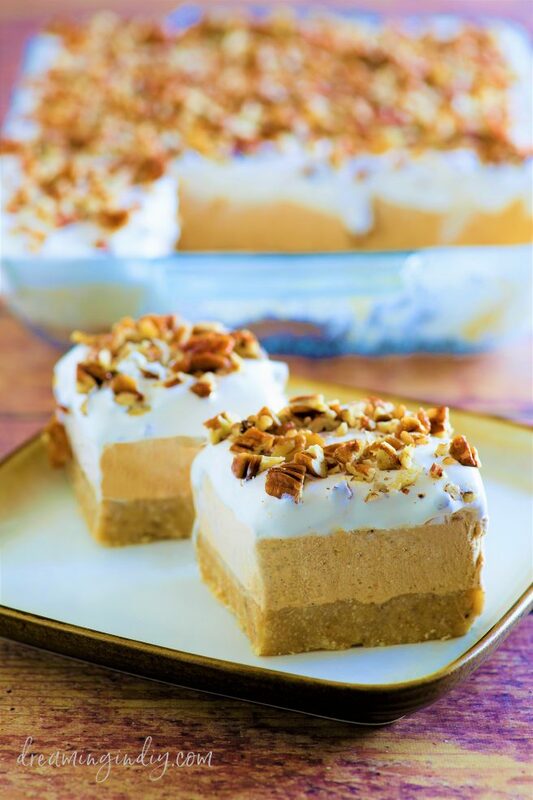 You’ll want to make this easy no-bake pumpkin dessert for all of your fall and winter dinner parties and holiday celebrations!